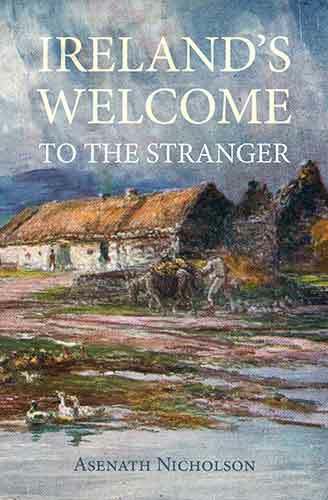 The present century in Ireland, may be characterised as a church and chapel-building one--and if posterity shall estimate us by the number of religious edifices which we have raised, we can hardly fail of being regarded as a pious people. How far that decision may be reconcileable with truth, it is not our business to enquire, but there is another judgment which will be formed in future ages on the evidence afforded by those structures, less subject to error, namely--the degree of civilization and taste in the Fine Arts, to which the present has arrived; and on this point we fear we shall have but slight claims on their respect, and that they will consider us as far inferior to those earlier ages which we are apt now to regard as barbarous. It is indeed unquestionable, that of all the numerous religious edifices now erecting, or lately erected in Ireland, there are but few, if any, in a pure and correct architectural style, and perhaps not one that could bear a comparison in beauty and symmetry, with many of the gothic structures of our ancestors. These observations have been suggested by our prefixed illustration, which represents one of the numerous parish churches recently erected in the neighbourhood of the metropolis. 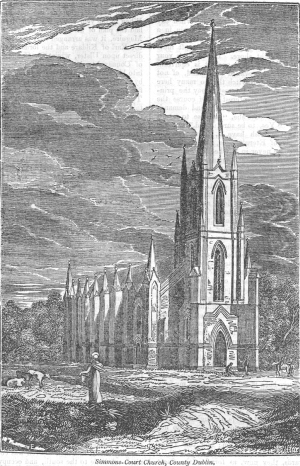 We do not mean to deny, that, independently of reli-gious considerations, these churches are pleasing objects in their general effect, and that their slender spires are appropriate, and add beauty and interest to the pastoral scenery of the county; but when we examine them on a closer view, there is as much to offend as please the taste. With one or two exceptions, they are all in the one style--a kind of non-de-script and novel gothic, unlike every known ancient remain, and exhibiting as little skill in the harmonious arrangement of their parts, as acquaintance with the true forms of the pointed style of architecture. These remarks apply equally to the Roman Catholic churches, in the gothic or pointed style, re-cently erected within the diocese, but with this difference, that as they are generally of a simpler and less expensive construction, their faults are less glaring. It should be understood that the architecture of a country is the truest criterion by which its taste in art can be estimated; because though the painter and sculptor may be supported and fostered into eminence by individual taste, the architect is patronised by communities. And until the public taste be so far improved as to enable it to discriminate between the characteristics of a genuine architect and a mere builder, we can expect no public edifice worthy the character of a refined nation. And we desire particularly to impress that the church architect, should be not only a man of taste and science, but also an architectural antiquary, intimately acquainted with all the peculiarities that characterize the different ages and styles of pointed and old English architecture, which are, in fact, as well marked as those of the Grecian orders; and that he should never be allowed an ad libitum license to indulge the fantastic vagaries of an eccentric taste, in violation of all the acknowledged principles of correct architectural style.